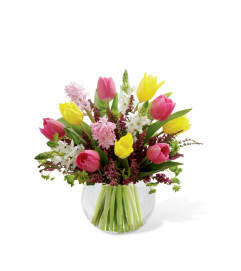 The FTD® Thoughtful Expressions™ Bouquet is a beautiful way to send your gratitude and affection. 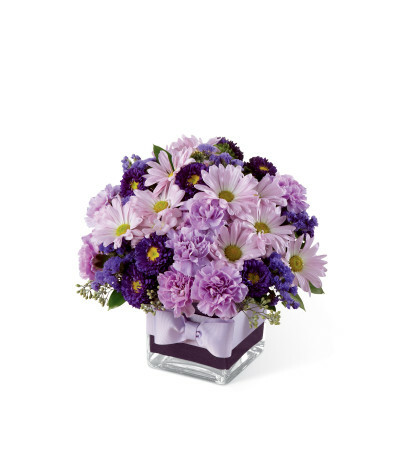 Lavender carnations and traditional daisies are brought together with purple statice and matsumoto asters accented with lush greens for a fantastic look. 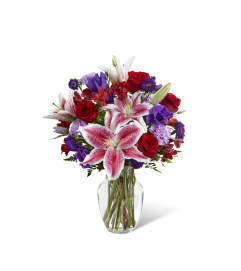 Arranged beautifully within a clear glass cubed vase set with violet foam and tied with a lavender grosgrain ribbon, this bouquet has a simple majesty that conveys your every wonderful wish for your special recipient.